Bolaño’s novella is a vicious 130-page attack on the hypocrisy and pretension of literary society in 1970s and 1980s Chile. The book is narrated as a deathbed self-confession by a Chilean priest and literary critic, Father Urrutia, who affirms at the start that his “silences are immaculate”, before embarking on a tale of moral compromise that spans several decades of Chile’s tumultuous recent history. This is a period that is particularly sensitive to the author, who is said to have returned to Chile in 1973, a month before Pinochet seized power, whereupon he was arrested on suspicion of terrorism and held for eight days before being rescued by two prison guards he happened to know. The satirical guns of By Night in Chile are, however, trained on that part of Chilean society that neglected its duty to observe, report and criticise the escalating political situation, and instead decided to indulge in what Bolaño portrays as a sort of febrile decadence that was brutally exposed after the fall of Pinochet’s dictatorship. The novella takes the form of a single paragraph, written as a stream-of-consciousness monologue describing various episodes of Father Urrutia’s life as a man of the cloth and member of Chile’s literary establishment. These episodes build an incremental culpability, beginning with sexual indiscretion and culminating in various forms of collusion with the Pinochet government; Urrutia is for the most part strategically placed at the fringes of the horror of what he is a witness to, allowing him to disingenuously plead that his hands are still clean as he nears his death. This purported innocence is challenged by the shadowy figure of the ‘wizened youth’, who is accused by Urrutia of having spread “slanderous rumours … to sully my name.” In actual fact, this mythical antagonist plays a passive role, and is used by the confessor as an imaginary interlocutor, presumably so that he can avoid having to make a real confession to a living priest. This adds to the surrealism that runs through the novella, due in part to the format of the writing and in part to the sense of near-death delirium that Urrutia creates at the outset (although the reader wonders whether perhaps this is just more special pleading). In shamelessly taking on Chile’s literary establishment, and several characters in the novel are clearly based on real people, Bolaño puts himself in an awkward position as a novelist. Indeed, part of the moral outrage at the heart of the novella stems from a sense that literature can often be held in excessive esteem. This is brilliantly conveyed in an episode of the book describing several meetings in Paris during the Nazi occupation between Ernst Jünger and the Chilean writer Salvador Reyes. Here, Bolaño creates an overwhelming sense of literary aloofness by having the two writers perpetually discuss each other’s novels in the company of a starving painter, while Paris burns in the background. This sort of aggressive imagery infuses the entire novella, and by using it so liberally the author manages to circumvent the obvious accusation that he is just another aloof writer, and in doing so reclaims his own sense of what it means to be a novelist, that is, someone who never turns his back on reality. 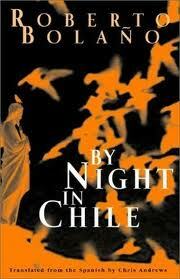 This novel was first published in English in New York, in 2007, by the publisher Farrar, Straus and Giroux. 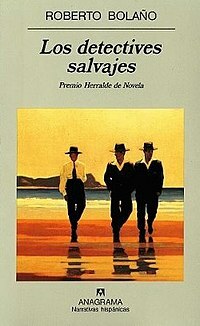 The original was first published in Spain, in 1998, by Editorial Anagrama, as Los Detectives Salvajes. I remember being passed a copy of the translation in a hamburger place somewhere around Baker Street in late 2008 or early 2009, and then reading it in Brixton in the month after that. I say this because it is a book that asks to be traced back to its origins, it is a book that challenges the reader to look behind it and through it, and it is a book that meticulously charts the passing of human life. The first part of the novel is entitled ‘Mexicans lost in Mexico (1975)’, and is narrated in diary form by Juan García Madero, a seventeen-year-old who has just joined a gang of Mexican poets that call themselves the Visceral Realists. The group is led by Ulises Lima and Arturo Belano, who are presented as mythical, cultish figures through the eyes of the young narrator. This first section lasts for about 130 pages before giving way to the second part of the novel, entitled ‘The Savage Detectives (1976-1996)’. The second section represents the bulk of the novel at around 400 pages, and switches narrator every few pages as it follows the lives of Ulises Lima and Arturo Belano in the two decades following their time as the Visceral Realists in Mexico City. The changing perspective, and the fact that this part is drawn out over twenty years and multiple countries, gives it a disconcerting effect, as though the writer is physically pulling apart the unity of the initial section. The novel then ends back in Mexico City in 1976 (‘The Sonora Desert’) with García Madero once again the chronicler of events. It is difficult to describe what exactly makes the novel so compelling, but part of it is undoubtedly the way in which Bolaño dissects the lives of his two protagonists. This is to a large extent an exercise in autobiography, and Arturo Belano shares a great deal with the author himself. It occurred to me after I had first finished reading the book that García Madero does not make an appearance in any form in the pages between the first and third sections, as if he is completely forgotten by history. Some people might find this tragic, a promising young poet is just dropped from literary circles and noone sees fit to follow his career again. However, amidst the sense of nostalgia and lost opportunity that pervades much of the novel, it almost feels as though García Madero is the one who managed to get away, to succeed. In any case, we can only associate him with the present tense of his diary and the glorious possibility that he did in fact go on to write something brilliant.